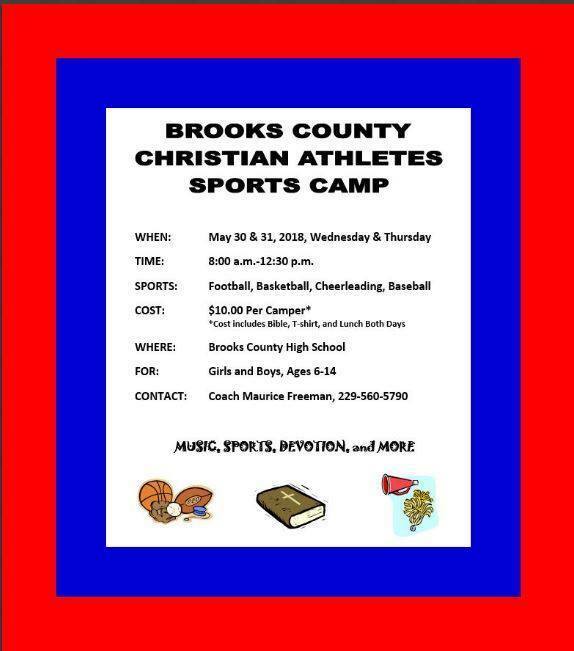 The Brooks County Christian Athletes Sports Camp will be held Thursday and Friday, May 30 & 31, at Brooks County High School. The camp will include Christian music and devotion, as well as sports instruction. The Brooks County High School coaches will lead the camp. The cost of the camp is $10.00 which includes lunch for both days. All campers will be given a Bible and a t-shirt. The camp is for boys and girls, ages 6-14. Call Coach Maurice Freeman (229) 560-5790 for more information or if you would like to volunteer or sponsor campers.